a billion is 1000 times as large as a million. I use a meter stick as "a picture of a thousand"
A meter stick is just under 40 inches long, a few inches longer than a yard stick. 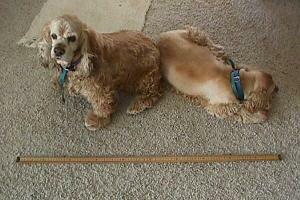 A meter is a typical height for a 3-year old child, or about the size of two cocker spaniels. A millimeter (mm) is about the thickness of a dime. 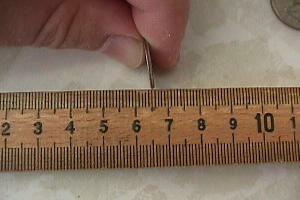 The smallest marks on a meter stick are 1 mm apart. There are 1,000 millimeters in a meter. then 1 meter represents ONE THOUSAND TIMES AS MUCH. There are 1,000 millimeters in a meter; there are 1,000 meters in a kilometer. There are therefore 1 million millimeters in a kilometer. A billion millimeters would be 1000 kilometers. It was designed for easy computation! Adding a zero makes a number ten times bigger. Adding three zeros makes a number 1000 times bigger. Each step represents a number 1,000 times bigger than the previous step. Question: Counting by millions, what comes after a million? Is it a billion? Answer: NO. After a million comes two million, then three million, then four million, etc. It takes a thousand millions to make a billion. The vertical scale of the L-Curve is based on the thickness of a $100 bill. Another possibility is that you just may not understand the numbers. Hopefully these pictures and word pictures will help. *In long-standing British usage the word Billion is taken to mean a million millions (1 followed by 12 zeros). A British reader of this site informs me, however, that this is no longer the case. What Americans call a billion is 1000 millions (1 followed by 9 zeros). Throughout this web site we mean Billion in the American sense of the word.